It's the personal touch that make this Sukkot craft so adorable. This dish is now a staple on my buffet table for all fall Jewish holidays, because I like to incorporate a new fruit (pomegranate) or fall fruits (raisins, apples, pears in their dried form) for Rosh HaShanah and Sukkot. 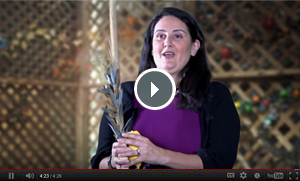 Rabbi Sari L. Laufer explains how to say the blessings and shake the lulav in a sukkah, and other basics about Sukkot. Inhale the aroma of a citron - the lemon-shaped fruit with thick, dense skin - and you'll encounter an exhilarating fragrance. Find a welcoming Reform congregation near you.